Below is a ranking of the top colleges for non-traditional learners. The methodology used to determine this ranking was based on both statistics and the opinions of experts in the industry. Additionally, surveys were sent to students to determine their level of satisfaction with their education as non-traditional learners. When it comes to learning, there's no right way and no wrong way. Instead, there are Multiple Intelligences (a theory proposed by Howard Gardner in 1983). Multiple Intelligences refers to the different ways in which people learn. The seven methods are: Visual, Verbal, Logical, Bodily, Musical, Interpersonal, and Intrapersonal. Of course everyone learns using a variety of these intelligences, but the theory just goes to show that sitting in a classroom listening to a lecture isn't effective for all students. Students who prefer an alternative education environment are referred to as non-traditional learners – and there are hundreds of thousands of non-traditional learners around the country. 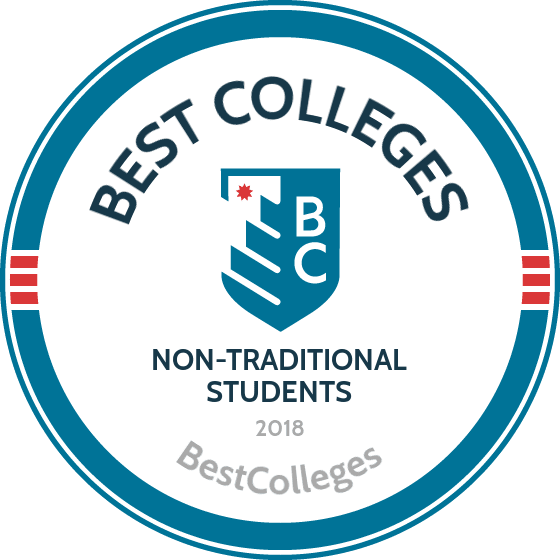 When it comes to choosing a college, non-traditional students will do themselves a favor if they take the time to explore a wide range of options and find a school that caters to their particular learning preferences. Here's what non-traditional prospective students should consider when checking out potential colleges. The College of Idaho offers a PEAK program, allowing a student to graduate with a major and three minors in the same time. This approach is great for non-traditional students as it enables them to become proficient in a wider range of subjects, while not making further demands on their time than the four years a typical institution requires. The Maharishi University of Management pride themselves on their elevated quality of life, providing sustainable organic produce in their vegetarian kitchen, giving opportunities to meditate on campus, and allowing the students to focus on their studies one at a time. For a non-traditional student trying to juggle work and school, this relaxed pace could be the perfect choice. Evergreen State College enables students to pick their own program of study. They discard the traditional grading system in favor of applied learning. For a non-traditional student, this provides the unique opportunity to devise a singular program of study, making the Evergreen State graduate stand out from the crowd. College of the Atlantic offers just one major which is human ecology. Through interdisciplinary classes, students apply their learning to a large-scale project that they will complete before graduation. The interdisciplinary approach enables a non-traditional student to gain applicable knowledge right out of the gate, which they can utilize immediately in their present occupation. Naropa University was founded by a Tibetan monk and leans heavily on Buddhist teachings as they devise their educational approach. It has resulted in a mingling of arts, Zen, and the pursuit of knowledge. This non-traditional school would be perfect for a non-traditional student. Goucher College, the only college in the country to do so, requires an abroad study to equip her graduates with a multicultural experience. Providing instruction from other perspectives enables students to be better rounded and more open minded. This gives non-traditional students a great opportunity, both for personally edification and coveted resume content. St. John’s College is firmly planted in academics, requiring all students to take four years of language, math, and interdisciplinary studies, and three year of science. However, this college takes a refreshing break from homework and instead places emphasis on discussions. As many non-traditional students already have real life experiences, they'll find such discussion particularly stimulating. Antioch College makes mandatory cooperative education, requiring their students to regularly alternate between course work and full-time work. Doing so ensures that the graduates of this college are capable of living and working productively in whatever community they find themselves. Alverno College, in their relentless endeavor to provide society with high functioning, successful individuals, discard grades in favor of evaluating their students based on their person. Instead of GPA, the college provides a transcript describing each student's person, growth, and achievements. For a non-traditional student, the lack of necessity to pursue grades so they might pursue learning comes with a sigh of relief. Olin College has devised an educational program for engineering students with the intention of molding them into individuals who look for needs, solutions to those, and edify the world in their endeavors. They do this by focusing the studies of each student around a large-scale project. All students receive half scholarship, which makes this a financially wise choice for non-traditional students. Berea College maintains their status of social pioneers, which they've earned through their rich history. (Berea College was the first college in the South to become interracial and also the first college to be co-ed.) They're committed to providing quality education to promising individuals with financial hardships, offering free tuition to those who work on campus for 10 hours a week. Thomas Edison State College is an ideal choice for non-traditional students. For the self-motivated learners, like Thomas Edison himself, this college's distance education program, equipped with five different formats specifically engineered to compliment a wide range of learning styles, is perfect for any non-traditional student. Whitman College located in Historic Walla Walla, Washington offers 45 majors. They have many scholarships available, including one specifically for a non-traditional student at $5,000. Their comprehensive exams which must be passed in order to graduation ensure their students have learned the information well. Beloit College prioritizes applied learning and seeks to embody a education style that changes lives and motivates it students so that they might, in turn, change and motivate the world. Their flexible curriculum makes this an excellent choice for non-traditional students. Austin College having unique study abroad programs allowing students to find just the program they're looking for. Consequently, more than 70% of students utilize this opportunity. Furthermore, their low student to faculty ratio ensures that the non-traditional student won't get lost in the crowd. Allegheny College, requiring their students to select both a major and a minor from different fields, develops well rounded students who can then apply their learning in either their major or minor or find a specific niche that incorporates both. Non-traditional students, especially those with a career already in hand, can combine unusual disciplines to optimize themselves for their position. Colorado College divides their semesters into eight sessions. With one class per session, projects, homework, and attention do not need to be juggled. This format allows classes to be completed in a short period of time, so it's perfect for the non-traditional students just interested in taking a class or two. Eckerd College proudly offers to non-traditional students their Program for Experienced Learners. This program has been designed with the working adult in mind. Their eight week courses are available in the evenings and on the weekends. The wide offering of courses allows them to meet any students scheduling needs. Hampshire College, encouraging students to make educated decisions, spends the first year of schooling delving into various schools of thought, their second year focusing on one, and their third year, they begin working on a large-scale project. Part of a five college consortium, this small college has an impressive number of resources, classes, and opportunities available to her students, as they can utilize the other colleges in the consortium. Bennington College, with plans like the Low-Residency Format of the MFA in Writing, where students spend two 10 day intensive studies on campus and the rest of the year is spent out in the world, has unique programs of study for any lifestyle. Non-traditional students should look into each of these programs to find the one specific to their needs. Brown University, although part of the Ivy League, is structured very differently from the others. Part of a student's responsibility is to devise a curriculum for themselves with assistance from the advisers. With the number of resources Brown has to offer, the possibilities are endless, providing a truly unique educational experience. New College of Florida, slightly different from the other colleges that allow a personal plan of study, has their students sign seven contracts for each semester when they've settled on a plan. After the period, advisers check to see if the terms of the contract were fulfilled, providing students with a narrative evaluation instead of grades. College of Wooster pairs students with faculty members. Students then work with their faculty partner to focus on either a thesis or a large scale project to work on during the course of their studies. And with over 120 student organizations, any non-traditional student will be able to find an extracurricular activity that meets their needs and gets them involved in the college community. Smith College offers non-traditional students an opportunity to be Ada Comstock Scholars, named after a pioneer in education, the first woman to be an academic dean and the first woman to be the president of a college. With over 1,000 courses to choose from at Smith, in addition to any course offered by the four other area colleges, the perfect plan of study for any student is available. Bard College gives high school sophomores to seniors the chance to take college classes before they would traditionally be able to do so. While non-traditional students are traditionally adult learners, such students seeking to start scholarly work sooner certainly fall under this term, as well. It's predicted that 5%-18% of children suffer from anxiety. While the causes of anxiety vary widely, many students feel intimated by grades and test in school, causing them undue stress. Some non-traditional students might do better at a college without the traditional A-F grading system. Grades are instead pass/fail reducing the stress over each assignment and allowing students to focus on their overall course experience and success. For students who struggle with the thought of picking just one major and one career path for life, a non-traditional college offering interdisciplinary study options might be a better choice. A variety of colleges these days allow students to just a pick a “focus” to their studies and tailor their class schedule according to their preferences – not a college course catalog. Non-traditional students who don't want to be tied down to the same college for an entire four years of studying because they feel like they learn more about life and themselves while on the move should look into a college that has multiple campuses, a strong emphasis on international study abroad programs, and more. People who prefer learning by doing should find a college that emphasizes real-world experience through internships, mentorships with professionals, and more. While vocational schools are ideal for some, non-traditional students looking to blend academia with work experience will be able to find the right college for them with just a bit of searching.